Photo: L-R Lyttelton Port of Christchurch Chief Executive Peter Davie, Te Ao Tūroa General Manager Kara Edwards (representing Te Rūnanga o Ngāi Tahu), Environment Canterbury Commissioner Elizabeth Cunningham, Te Hapū o Ngāti Wheke (Rāpaki) Chairperson June Swindells, Christchurch City Councillor Andrew Turner. The initiative will see five major players in the management of Whakaraupō/ Lyttelton Harbour – Te Hapū o Ngāti Wheke, Te Rūnanga o Ngāi Tahu, Environment Canterbury, Christchurch City Council, and the Lyttelton Port Company – join forces to create an action plan for managing and restoring the cultural and ecological health of Whakaraupō. 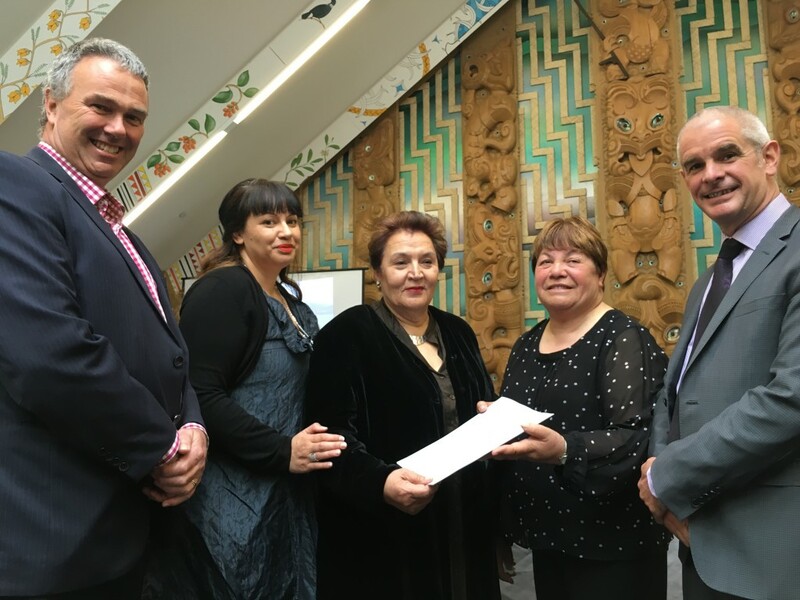 Representatives from the five organisations signed a Memorandum of Understanding at Rāpaki Marae today. The need for a Whakaraupō/ Lyttelton Harbour catchment scale management plan was discussed in detail through the development of the Lyttelton Port Recovery Plan process last year. Sedimentation in the upper harbour had increased since human settlement and as a result the health of the harbour and traditional food sources were in decline. Both the community and the partner organisations recognised the need for a collaborative process, and today’s launch signified a new way forward. Te Rūnanga o Ngāi Tahu Kaiwhakahaere Tā Mark Solomon said managing the harbour needed to move beyond words and into action. “For me the focus needs to be on actions, more than words. We need to restore the harbour as a source of mahinga kai for future generations,” he said. A group comprising representatives of each partner organisation will build on existing knowledge to identify actions to improve the health of the harbour. New research will be conducted, where required, to fill in knowledge gaps. The group will also collaborate with the community through a series of workshops to ensure the community’s ideas are incorporated into the action plan. Te Hapū o Ngāti Wheke (Rāpaki) chairperson June Swindells said it was up to everyone to play their part in restoring the harbour. Lyttelton Port Company chief executive Peter Davie said the partnership between the five organisations and community was a great move and LPC were proud to be part of it. “LPC is committed to actively engaging others to understand the harbour environment and using that knowledge to manage port operations and developments. “We see this as the start of an enduring framework for understanding and improving the health of the harbour. The coordinated approach will support community aspirations to ensure the harbour is maintained and protected for future generations to enjoy,” Davie said. Christchurch City councillor Andrew Turner echoed those sentiments. “The development of the Whakaraupō Catchment Management Plan is a positive outcome of the Lyttelton Port Recovery Plan, and is a real opportunity for collaboration between the parties involved and the communities around the harbour,” he said. “There is strong interest from residents in the water quality and health of Lyttelton Harbour and I look forward to developing initiatives and outcomes that will bring about long-term improvements in these areas”. Environment Canterbury commissioner Elizabeth Cunningham said the regional council endorsed the collaborative approach to managing resources. The community workshops will begin in September. A website outlining the Whakaraupo/Lyttelton Harbour project also launched today.